This spinner is made of a solar max fade resistant nylon material. Makes a fun addition to any yard. Size is 13"x19.5" and 28" in diameter. This spinner is made of a solar max fade resistant nylon material. Makes a fun addition to any yard. comes in two sizes. One is 12"x18" and 9.25" in diameter. The other is 16"x24" and 26" in diameter. Great to attract attention at your house or business. 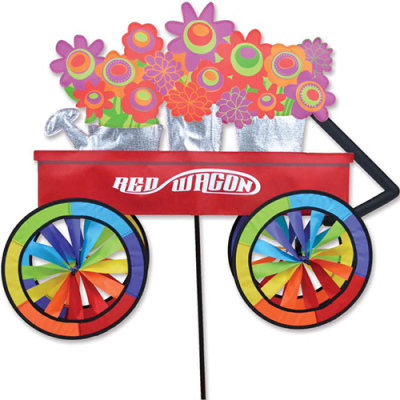 Red Wagon Wind Spinner. Made of SolarMax Nylon, and Heavy Duty Fiberglass. Our Spinners are better and stronger than any manufacture.Comes complete with everything you need to display your spinner. These Petite Spinners are made out of durable polyester rip-stop nylon and come with everything you need to display the spinner in the ground. They are 25" x 6.5" with a diameter of 13.5"